"Wherever you are; Get action!" 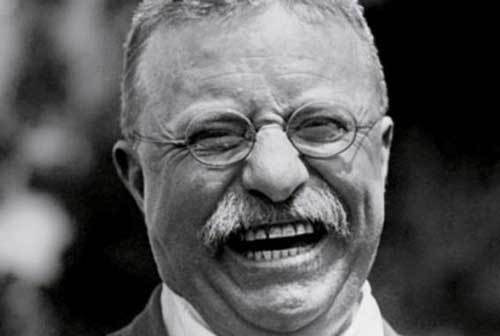 "The year 1912 was a presidential election year, and former President Theodore Roosevelt was again campaigning for the nation's highest office. By the evening of October 14 his campaign had carried him to Milwaukee, Wisconsin, where he was to deliver a speech in the city's public auditorium.The time was nearing for him to speak, so he strode from his hotel onto the sidewalk outside, where a car was waiting to take him to the auditorium. As Roosevelt walked toward the car a man suddenly stepped up to him and pointed a pistol at his heart. The gunman pulled the trigger and a bullet burst from the pistol and smashed its way into Roosevelt's chest. His shirt was suddenly spattered with red, and more blood immediately began seeping from the ugly hole. The bullet had come to rest against his rib cage, a mere half inch from his lungs. It was a rousing performance. Roosevelt was a wonderful, charismatic orator under any circumstance, and the sight of his spattered shirt and notes added a spectacular portion of drama to his speech. Only after he had completely finished his performance did he take time to go to a hospital and have the wound tended." Promoters have a knack for knowing where the action is. They have an appreciation and palate for the finer things of life, the best food, the best wine, expensive cars, and fashionable clothes. They have a natural instinct for reading people, and are smooth in social circles, knowing many people by name, and knowing how to say just the right thing to most everyone they meet. Promoters exude charisma and their flamboyant style makes them irresistibly captivating. Promoters are engaging and fully present with their audience. They poetically persuade others to have confidence in them and to go along with whatever they propose. They are highly energetic and can energize others. Their "in the moment" spontaneity keeps things exciting, and keeps the enterprise moving on the cutting edge. Promoters are so engaging with people; they are uncanny at reading people's faces and observing their body language, hypersensitive to the tiniest nonverbal cues that give away the other's attitudes. These smooth operators are usually something of a mystery to others. Promoters are always in motion—they become restless when they are not on the move. Since they are always jumping from one activity to the next, they come across as unpredictable, but to themselves, they are actually quite deliberate about their movements. Those that are closest to them are fellow sprinters who move just as quickly. In relationships, others may feel that the only certainty in Promoters is that things are uncertain. Promoters are daring thrill seekers, and feel quite at ease exposing themselves and their enterprises to risk. They firmly believe in the axiom, "The greater the risk, the greater the reward." The higher the stakes, the more emboldened they become—for it is only when excitement looms in the air, that they are stimulated and come alive. They encourage others to take bold risks as well, and can be impatient with weakness or timidity. These high-rolling entrepreneur are decisive, and are comfortable with "letting it ride." Promoters cannot not take initiative. They are extremely proactive, and move quickly, aggressively, and preemptively to get to it first before all others do. They have a bias for action, seeking new experiences. And because of their high energy and lightning speed they can be sharp entrepreneurs, able to swing deals and kick-start enterprises in a way very few others can. Rather than working from behind the scenes, Promoters work best when they are out in front at the helm of the ship. Promoters are optimistic and persuasive—without peer as deal makers, promoters, and negotiators. They are bold, aggressive, and produce results. They can be hard-nosed utilitarians, willing to do whatever it takes to achieve their goals. They are able to advertise or publicize their endeavors, and to maneuver others in the direction they want them to go. It might be said that people are instruments in the hands of these Promoters, and that they play them artistically. Theodore Roosevelt certainly made a significant impact on the United States of America's future. Theodore Roosevelt Theodore Roosevelt...was one of America’s best presidents. He usually ranks in the top five of all presidents — a ranking he deserves. Roosevelt not only turned the United States into a true world power but he also began the long process of protecting the average U.S. citizen from the excesses of business. In the process, he increased the powers of the presidency, becoming the first strong president of the 20th century. Stadelmann, Marcus. U.S. Presidents For Dummies (Kindle Locations 3309-3313). Wiley. Kindle Edition. Whether you are interested in learning more about temperaments or President Theodore Roosevelt the following references and books will assist you in learning more about both. Keirsey, David. Please Understand Me II. Prometheus Nemesis Book Company. Kindle Edition. Keirsey, David. Presidential Temperament: Definitive Edition. Prometheus Nemesis Book Company. Kindle Edition. Strock, James M.. Theodore Roosevelt on Leadership. The Crown Publishing Group. Kindle Edition. Roosevelt, Theodore. Theodore Roosevelt, An Autobiography (Annotated and Illustrated): Includes The Complete Essay "The Strenuous Life" and Over 40 Historical Photographs and Illustrations. Hinton Publishing. Kindle Edition.